Comm Eye Health Vol. 23 No. 74 2010 pp 57. Published online 01 December 2010. Senior Clinical Engineer, ORBIS International, 520 8th Avenue, 11th Floor, New York, NY 10018, USA. Many ophthalmic devices have optical components such as windows, lenses, mirrors, filters, and prisms; even very small irregularities (such as scratches) can cause unwanted scattering of light which reduces quality. The surfaces of lenses, prisms, and windows are often coated with an antireflective layer to prevent loss of light due to reflection. Mirrors have a highly reflecting coating to get maximum reflection of light. Filters have coatings to cut out undesired wavelengths. The coatings are very thin and delicate and can be damaged by improper handling and cleaning. By following these suggestions, you will help ensure that all of the optical surfaces in your eye care equipment perform optimally. Place a dust cover over eye care equipment when not in use. Always replace the lens caps, if available, when not in use. Keep eye care equipment in an environment that is not humid; this will prevent the growth of fungus on optical components (see Issue, page 37). Repeated cleaning will wear out the surface coating described earlier and the property of the surface may change. It is better to protect optical components from dust, stain and fungus. If the optical component is not dirty, do not clean it. First, read the manufacturer’s instructions. Laser optics should only be cleaned by trained, qualified specialists. 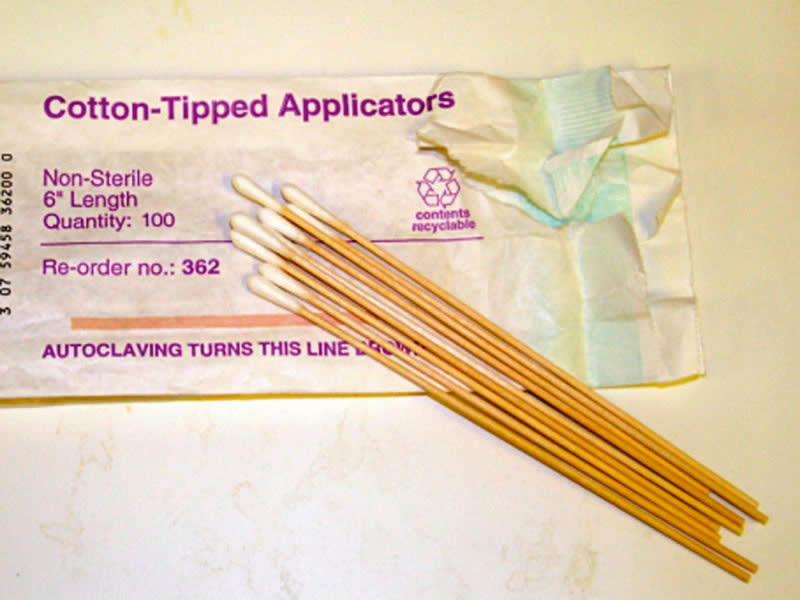 cotton swabs (Figure 2). Use non-sterile, medical-grade cotton swabs, with degreased fibres that will not release lint. If these are not available, fresh cotton swabs can be prepared with wooden sticks and medical-grade cotton. Isopropyl alcohol (90% purity). Note: slow evaporation can leave drying marks on the surface. Do not touch optical surfaces with your bare fingers, since they leave behind grease and moisture marks that are hard to remove. Wear cotton, lint-free gloves if available and hold loose optical components by their edge (Figure 3). Be careful of sharp instruments, including your fingernails, near optical surfaces. Use wooden, bamboo, or plastic implements instead. Always place optical components on a soft surface to avoid scratches. Do not apply optical cleaning solutions directly onto the optical components of a device, since these can enter the machine and cause spots on other lenses or otherwise damage the device. Instead, apply the cleaning solution to the lens paper or swab first. When removing stains, avoid excess pressure since this can remove the delicate surface coating. Always remove dust first! Dust particles can produce scratches. Never wipe dust off optical surfaces, especially when they are dry. First use a dust blower to remove dust. 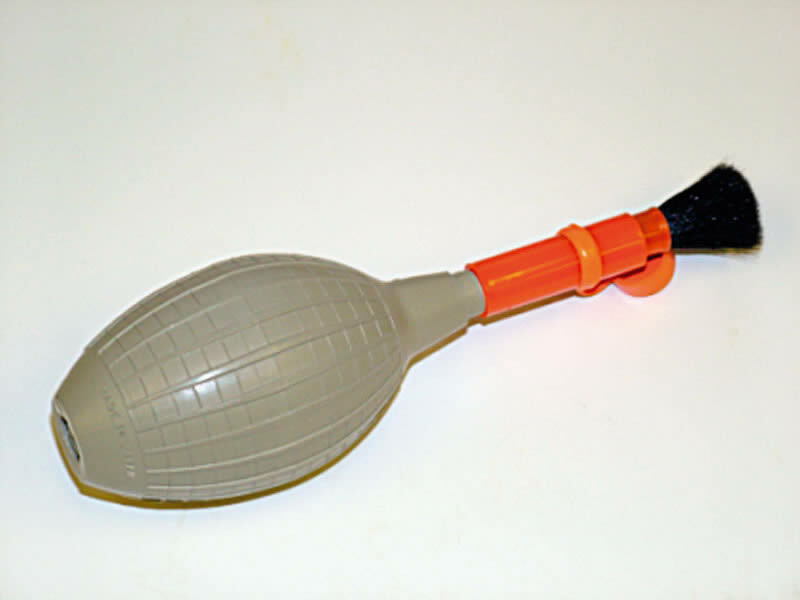 Use a camel hair brush, sometimes included as part of the blower (Figure 1), to remove any dust that sticks to the surface. To remove stains, use a lint-free cotton swab or a lens-cleaning tissue dipped in the optical cleaning solution. For round surfaces, move the swab or tissue in a circular path, starting from the centre and going in a widening spiral towards the edge (Figure 3). For rectangular surfaces, use repeated strokes parallel to each other and in the same direction until you have covered the surface. Repeat this step, using a fresh swab every time, until the stain is no longer visible at any angle under a bright light. If cotton lint is left on the component, remove it using the blower or a clean lens brush. To remove stains on plastic components, use optical cleaning solution number 2 (the waterbased solution). Do not use other cleaning solutions on plastic, unless indicated by the manufacturer, because they can permanently cloud the surface. To remove fungus, use an optical fungicide. If unavailable, use surgical scrub soap. This is the second instalment in a series on practical equipment care, maintenance, and repair.